Ferm Living’s Marbling wallpaper mimics the living surface of marble, and its flowing pattern also resembles water in motion. 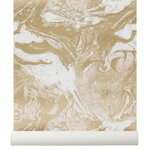 The pattern has been printed on durable non-woven paper that is made of a mix of textile and paper fibres. Compared to traditional wallpapers, non-woven wallpaper is easier and faster to hang since the paste can be applied directly to the wall. Printed on 150 g non-woven paper quality. Waterbased colours. Ferm Living recommends purchasing the needed amount of wallpaper at once due to possible colour variations between different batches of the wallpaper.